New artificial intelligence (AI) technology aimed at cutting flight delays is being rolled out at London Heathrow. The tech has been installed at the control tower at the London airport to help air traffic controllers (ATCs) track aircrafts during times of reduced visibility. The trial, which is being run by air traffic management service Nats, involves the use of ultra-high-definition 4K cameras, AI and machine learning technology. Heathrow has the UK's highest airport control tower at 87 metres but it can still be surrounded by low cloud even when runways are clear, with controllers relying on radar in these conditions. Nats believes the technology will be particularly useful at night, as the highly sensitive cameras will enable controllers to see the airfield as if it was dusk rather than complete darkness. 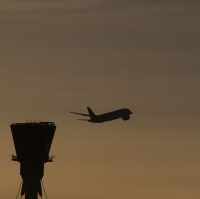 Nats chief solution officer Andy Taylor claimed Heathrow's ATCs have reached "the extent of human performance" and need technology to improve their efficiency and safety. He said: "I am convinced that this technology can totally revolutionise how air traffic is managed at airports around the world. It's man and machine working in perfect harmony," he said. The trial is part of a £2.5 million investment by Nats in a digital tower laboratory located inside Heathrow's tower. Kathryn Leahy, Heathrow's director of airport operations, said there are typically around 12 low visibility days a year when the tower is surrounded by clouds. She said: "When we've got low visibility in the morning and we're being regulated by Nats from an air traffic control point of view, that then knocks on to the next wave of aircraft that are due to depart. "You see that knock-on effect through the day." Are you heading on holiday from Heathrow this year? Make sure you have the right cover by checking out our single trip travel insurance options.